When I was growing up, my grandmother was a huge influence in my life. I looked up to her and listened to her stories with an intensity that I rarely paid others. I watched the way she interacted with others and respected her in a different way than I did my own parents. The beauty of extended family is that each family member has a unique relationship with a child, which differs to the relationship the child will have with immediate family members. Aunties, uncles, cousins, grandparents and parents will all have their own special way to encourage and challenge a child, and these relationships will work together to build a child’s character. Grandparents, of course, play their most important role by modelling. The way they speak to their grandchild, offer advice, and the way they live their own lives will leave a lasting impression on their grandchildren. But that is a whole article (or book) in itself. 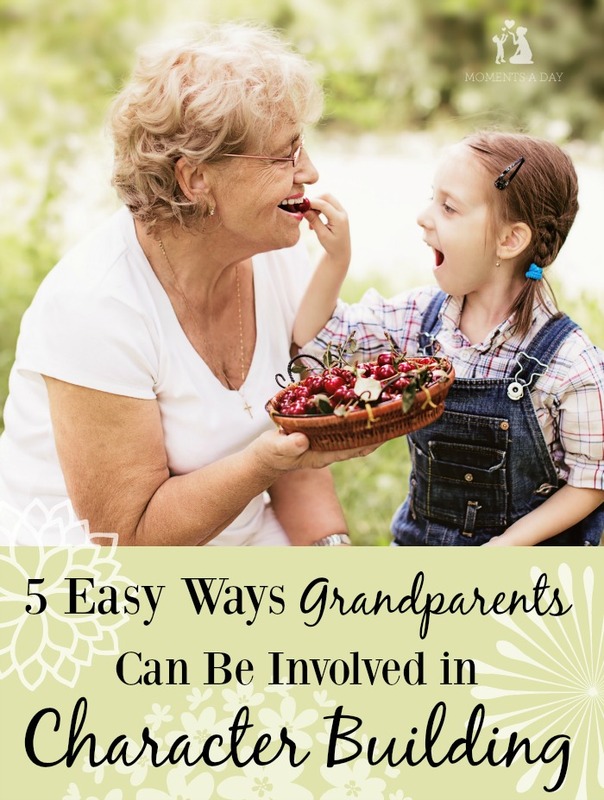 Here are a few easy ways grandparents can be involved in helping their grandchildren build character. Probably the simplest way to help a grandchild build character to give meaningful gifts. Birthdays and holidays never seem to end but that doesn’t mean kids need to receive things for pure entertainment. I recommend tons of character building books on the blog (here are over 30+ concept books and here are some recommended storybooks) and there are lots of games, CDs, room decor and resource ideas on this page if you are looking for gift ideas. The second way to help grandkids build character is to organise experiences that will encourage them to grow. My own grandmother sent me to a music camp where I developed confidence to sing and dance on stage. We went on hikes, visiited arts exhibitions, attended musical performances and more. One year she even took my sister and I on a train trip to another state and the conversations on the train alone were extremely valuable to me at that time in my life. Experiences with grandparents, big and small, are treasured and remembered by grandchildren. It can be something as simple as going to the library, baking together, or even drinking lemonade on the back porch. Exposing kids to different opportunities and coaching them through challenges is priceless. One of my readers Lynne who is also a grandmother says, “Virtues are the language of our souls and I consciously look for creative and energetic ways to bring out the best in my Grandchildren and myself.” Lynne used to be a teacher and has many ways she incorporates virtues into her home. Here are some of her ideas that you can enjoy with grandkids. Anyone can create Booties & Blessings which are perfect for a newborn. 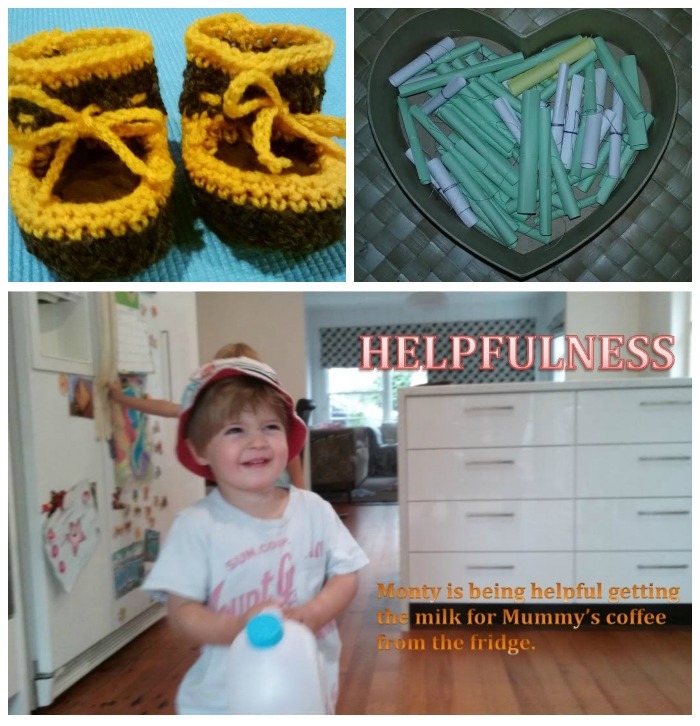 Buy or make a pair of babies booties and add a “blessing.” Here is an example of a blessing I created from the Virtues Project (printed out and given with the booties). “With these booties comes the blessing of: KINDNESS. Kindness is caring that springs from compassion. You are warm and friendly and ready to help, listening for the needs beneath the words. You are also kind to yourself. DETERMINATION. Determination is the power of intent that drives your dreams. It is the strength of will to act with resolve and focus your energy on a purpose. The purity of Kindness and determination can bring light to the world. These booties have been lovingly made by a Grandmother from 100% pure wool and sheep skin. It may also be nice to teach older grandchildren how to make these booties to give to newborn cousins, neighbours, or friends! The last idea is picking a random Virtues Affirmation Scroll rolled up and in a heart box. These can be picked out any time – not only with the grandkids but during workshops, with clients, or other gatherings!” You can find Virtue Affirmations on the cards available here. What other ways can grandparents be involved in character education when kids are young? Please share your ideas and experiences in the comments! We are so lucky that our girls have 2 sets of grandparents that not only adore them but also do all of things you mentioned above. I’d be lost without their help and my girls would miss out on all the wisdom they have to share. How lovely 🙂 Both my husband’s parents and my own live in different countries and we very much miss their daily input into our family life! Such a treasure to have grandparents around. Grandparenting a preschooler is both challenging and enjoyable. Here are some tips to bond with your three-year-old. yes definitely this is a good way that parents and grandparents can work together in developing a child’s character. The grand parents have a lot of influence on a child’s mind. They also hold a special position in the child’s mind. My children are lucky to still spend time with their grandparents. They love to spend time with the grannies because they enjoy to the fullest and get almost whatever they want. Thanks for sharing some activities. I will suggest these to my moms.